Review: Suspenseful, adventurous, and exciting all describe Sofia Quintero’s Efrain’s Secret. The main characters are Efrain, his mom, Nestor, Candace, and Rubio. Efrain is a Puerto Rican boy who lives in the Bronx , and the story is described from his perspective on what happened in his very eventful senior year. The story starts out with Efrain looking over the costs and requirements of going to Harvard University. After looking over them he decides that he is going to need more money and will have to get a higher score on his SAT’s to get in. His whole life has been dedicated to going to an Ivy League college; he became an honor student, tutored people who were academically challenged, and studied in most of his free time. Eventually he meets his old friend Nestor, a boy who dropped out of school and became a drug dealer. Nestor convinces Efrain to join him, saying that drug dealing would be the fastest way to make enough money to go to Harvard. He told Efrain to face it, his good-for-nothing father left his mom and would not be willing to pay for college and his mother is already struggling to put food on the table and a roof over their heads. Efrain takes on a double life - honor student by day, drug dealer by night - a life that only Nestor knows about. One day, he meets an African American girl from New Orleans named Candace, who has relocated due to Hurricane Katrina. Efrain and Candace fall in love. Will Efrain ever make it to Harvard University? Will Candace ever go home? All answers will be unveiled in Efrain’s Secret. 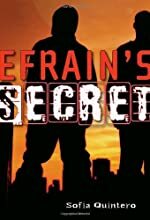 First of all, I think that Efrain’s Secret is an outstanding book. I like the part when Efrain sees the rating of the game that Nestor’s six-year-old brother, Melo, plays because I could relate to that experience. Efrain is shocked that such a young boy would be playing a mature game. The book is also very descriptive, so much to a point that I felt like I was with Efrain. Also, the author uses words that would be used by someone who lived in the ‘hood’. This makes the book seem more realistic and brings the plot to life. Some words of caution however, this book is for young adults. I recommend that readers should be over the age of thirteen to read this book because it contains a lot of strong language and adult humor. Finally, the general idea in the book – a person with the ability to go far, but without the resources – is a challenge many readers could identify with. Efrain shows how he’s willing to risk everything to achieve his dream. Overall, this book deserves five out of five stars. We would like to thank Random House for providing a copy of Efrain's Secret for this review. Have you read Efrain's Secret? How would you rate it?